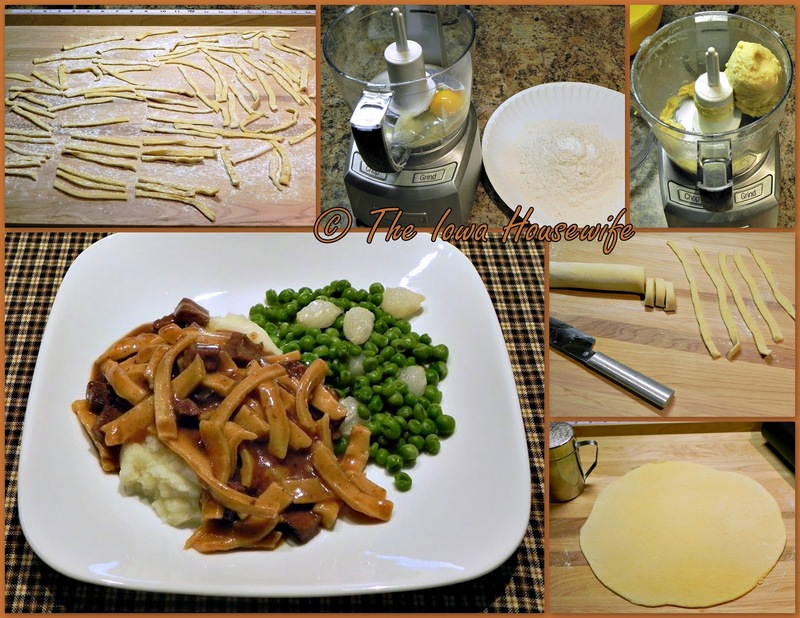 Here is the absolutely easiest way to make homemade noodles in small amounts…in your smaller food processor. No hand kneading, they are quick enough for me to prepare right after breakfast to have ready in time for lunch! I use my favorite recipe from “Cooking with Lard", but your recipe will work too. I find the lard helps my noodles roll out really easily, and they taste good. I don't follow other recipes I have seen for this that put the flour in first...it blends in better when added last. I actually use my small compact food processor for this – works great. I don’t usually wait for these to rest before rolling them out, as my husband likes them a little thicker anyway. Rolling them up and slicing them goes very quickly too, it’s the way my mother-in-law taught me to make them. If it’s just going to be the two of us, I put half of the dry noodles in the freezer for another day, and halve the amount of broth and meat or poultry. In 4 cup food processor, combine lard, skim milk and egg. Reserve the water. Pulse until mixed. Combine the flour, salt and baking powder. Add to the egg mixture. Process until it forms a ball; adding the water or a teaspoon of flour as needed until a ball forms that is slightly tacky but doesn't stick to your hands. Process only 15 seconds longer. Turn out on a well-floured board and cut it in half; any air holes should be small. If they are over 1/8", continue to knead by hand. Let dough rest, covered, 10-20 minutes. (I find this often even isn’t necessary, you can just roll them thinner after they rest). On the floured board, roll out the dough as thinly as possible. Roll up and slice into 1/4" slices. Shake out noodles on lightly floured board. Save the flour for your gravy. Let the noodles dry 2 hours. To make gravy, place the broth in a 1 1/2 quart saucepot and bring to a boil. Whisk in the flour to thicken. Add the chicken or beef and noodles, lower the heat to medium-low, and cook, covered, for 30-35 minutes until noodles are tender and broth is thickened. Stir them frequently, so they don’t stick to the bottom of your pot. Serve immediately over mashed potatoes. Four Servings Yield: "5 Ounces of uncooked fresh noodles"
For 4: Cook 1 pound potatoes, diced, for 15-16 minutes, mash with 2 tablespoons milk and 1 tablespoon butter. Cost: The noodles cost me about 63¢ for 1 pound of dough when eggs were $1.50 a dozen. Compare to frozen noodles for cost; the same day, Reames Frozen noodles cost $3.85 a pound. Sue, are the noodles made with lard more tender than those made with just egg, water and flour? I think they roll out better, have a good flavor, and are tender, but don't fall apart either. I like this recipe when I make them by hand instead of in my pasta rollers/cutters. My husband's family are the experts on home-made noodles; my sister-in-law's mother used this recipe, larger of course, to feed 8 kids. She was a wonderful cook. Bonnie's mother also rolled them out on paper, then threw it away to make even less cleanup. We like to have just a few occasionally for my husband and myself; and this is the easiest way to make them without much fuss. OK, good to know. I'll try it. Thanks! You were right, we did like them. Very tender. Easy to make. My FP was too big to do the job so I just did it by hand and it was quick and easy, made just enough dough to roll out on the counter, and it all fit in a saucepan. Delish! Thanks so much for sharing. Glad you like them as much as we do...it's nice to make just a small amount occasionally. The noodles are a real tradition in my husband's family, and really, in this area of Iowa.